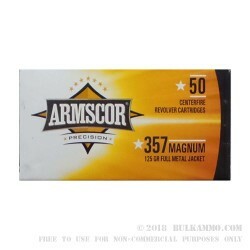 Load up your .357 Magnum revolver with this ammunition from Armscor for some inexpensive target practice. This accurate load uses FMJ bullets for reduced lead exposure compared to unjacketed rounds. Each cartridge in this box of 50 fires a medium weight 125 grain full metal jacket bullet. This particular ammunition is made at Armcor's headquarters located in the Philippines.